So the My Tracks guys released version 1.1.10 last week. This normally would be a good thing as they have been adding lots of nice new features and generally improving things. Unfortunately in this release they also included a feature that stops 3rd party apps using their database without the user having to go into the their settings and allowing it. 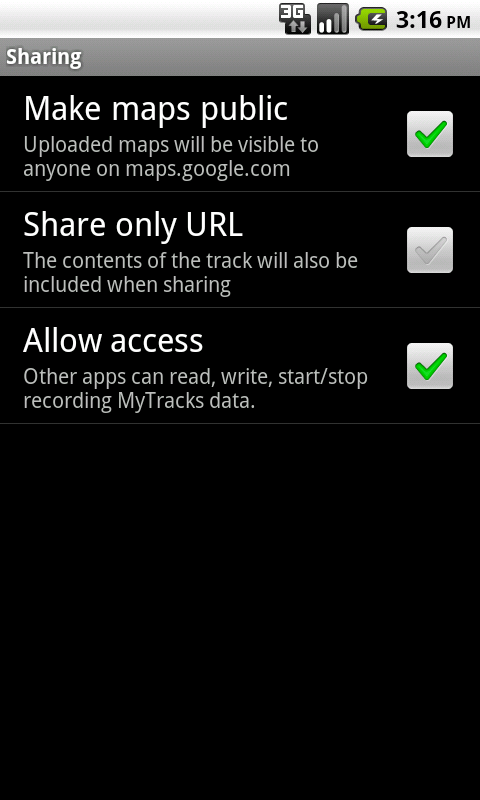 I don’t agree with what the change is looking to achieve, My Tracks already has a set of Permissions that need to be requested by an application before it can access the data. If the user does not want to grant access then they should not install the 3rd party apps. I know nobody really reads closely the list of Permissions apps ask for at install time, but this is a problem for the Market application to solve by better high lighting the Permissions being asked for and explaining the consequences of accepting them. On top of that there is no easy way to check if the “Allow access” option is set before you try and access the data. I will be raising a issue about this shortly as well as submitting another change to mean that I don’t have to try and guess the name of the track being exported. It also would have been nice to get more than a couple of hours notice that the this new “feature” was about to ship. While I know it has been discussed on the site, I have a not been following the updates recently because the day job has been particularly busy. It would have at least been courteous to send the email that notified the owners of those with apps about the change a little sooner. So we had time to make the required changes rather than just get a whole slew of bug reports. Anyway that’s the bitching out of the way. 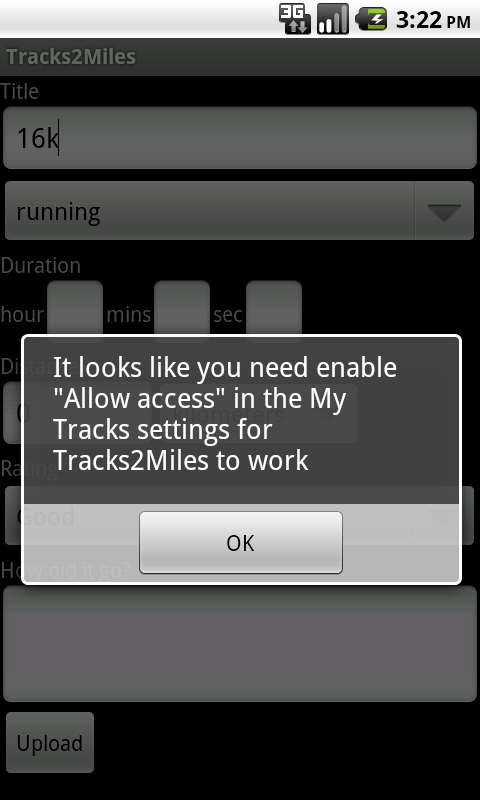 There is now a new version of Tracks2Miles that will show a dialog box if it can not access the data and return you to My Tracks to enable the access to the data.